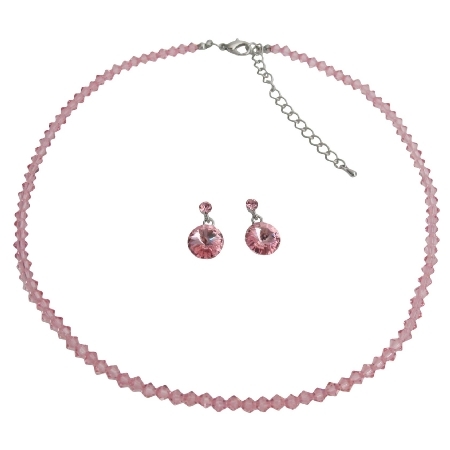 This breathtakingly beautiful necklace & earring set features Swarovski Rose crystals round the necklace with matching round surgical post earrings quality jewelry using warovski crystals. Handmade jewelry for love or for yourself very sleek dainty & delicate jewelry. This item in Traditional Necklace Sets category was first added to our catalog on 11-07-2015. Buy Dainty Delicate Rose Pink Crystal Jewelry Best Gift For Your Love , sold & shipped by Fashion Jewelry For Everyone where you can shop online for Leading Online Retailer for Indian Fashion Jewelry. This Necklace Sets collection has been tagged as Dainty Jewelry,Delicate Jewelry,Rose Pink,Rose Jewelry,Pink Rose,Pink Jewelry,Crystal Jewelry,Jewelry Gift,Gift Jewelry,Your Jewelry,Love Jewelry,Dainty,Delicate,Rose,Pink,Crystal,Jewelry,Best,Gift,.